Parchment making at the Bodleian 2013. Having worked as a bookbinder for five years, Arthur graduated with distinction from a Post Graduate Diploma in Conservation at Camberwell College of Arts in 2008. 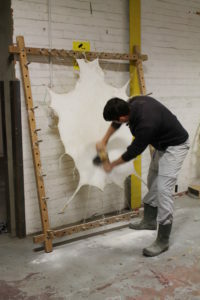 He continued his training with internships at The Leather Conservation Centre and The British Library. Arthur has also worked for the Oxford Conservation Consortium and spent over five years working on the collections of early printed books and manuscripts at the University of Oxford’s Bodleian Library. Highlights have included working on a late-medieval Chaucer manuscript, and as part of the project to conserve and digitise the Bodleian’s First Folio. Arthur’s particular interests lie in the development of the book; from the early Ethiopian codex to English stationery bindings of the 19th century. Arthur has published on bookbinding and conservation and started teaching in 2012. In 2016 he established Green’s Books.